These quick and easy, vegetarian, Ginger Mashed Potatoes are a perfect side dish for fall and lovely for Thanksgiving! They’re creamy, rich and packed with warm flavors. If you’ve been following my recipes and blog for a while, you know my main passions in life are family and food, and that most of my days are composed of creating recipes, photography, my two boys, my parents, etc. Here’s something you probably don’t know. . . . I love rock climbing. This picture was taken of me a couple of weeks ago in Joshua Tree climbing on Stone Head. Yep, that’s me! And how gorgeous is Joshua Tree!? Of course my main purpose today is to share these scrumptious Ginger Mashed Sweet Potatoes with you. They’re exactly that — scrumptious! With a touch of cinnamon and lightly sweetened, they’re really a treat. And the fresh ginger adds an ideal amount of heat and interest to the creamy, rich potatoes. Like the majority of recipes on Cooking On The Weekends, this is a comfort food, through and through. At least by my definition. Naturally, I do a lot of comfort food cooking in the fall and winter months. We all want warming, cozy foods when the temperature drops and night falls earlier. This yummy side dish is almost like a savory sweet potato pie filling. 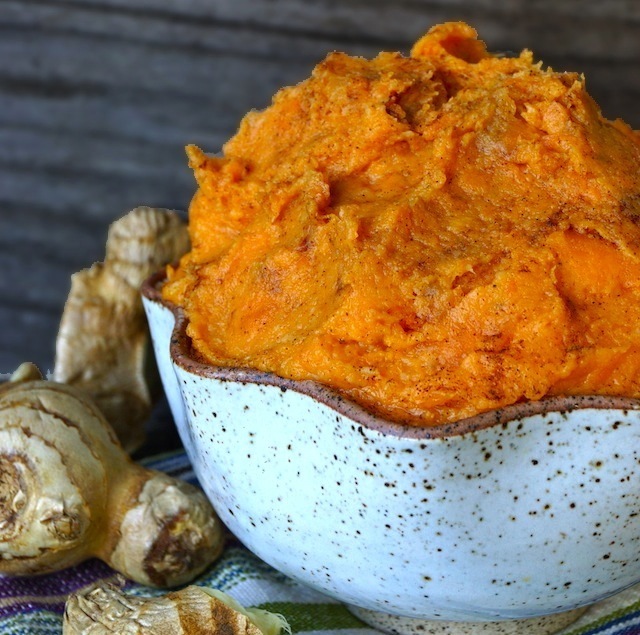 And speaking of pie, these Ginger Mashed Sweet Potatoes would be absolutely perfect along side your Thanksgiving turkey. The holiday is right around the corner, after all! Of course it would also work with steak, fish, or even a hearty side of vegetables. And to add to all of the deliciousness, the recipe only take about 25 minutes to prepare, making them especially desirable to add to a holiday menu. So there you have it, a new Valentina fact, and a tasty recipe. These quick and easy, vegetarian, Ginger Mashed Potatoes are a perfect side dish for fall and lovely for Thanksgiving! They're creamy, rich and packed with warm flavors. Peel the sweet potatoes, and then cut them into bite-sized pieces, about 2-inch cubes. To get the ginger pulp, use a super fine grater, like a microplane grater, to grate the ginger. If you don't have one, chop it as finely as possible, until it's juicy. 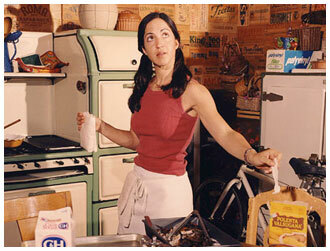 Wow, I had no idea you were a daredevil except in the kitchen! This looks fab! For a non-dairy version, you could sub the cream and butter with full-fat coconut milk and coconut oil. OMG, That’s YOU way up there on that boulder??!?!?!?! Ginger is a perfect compliment to sweet potatoes. I’m thinking this may be on our Thanksgiving table instead of the marshmallow style ones. Ginger in mashed potatoes. That’s brilliant. I could eat my body weight in this lovely mash – how delish. Wow, rock climbing that is so very cool. Loving the ginger. Gonna have to up my sweet potato casserole with some. omg … you are a brave, brave woman! Kudos to you! And those sweet potatoes? Yes, please! Fall is here, and I adore sweet potatoes this time of year … putting your version on the to-make list!